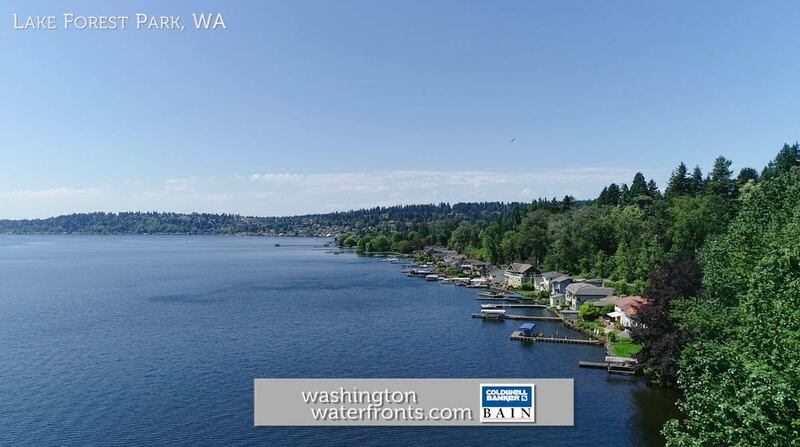 Lake Forest Park lies just north of Seattle, a bedroom community along the shores of Lake Washington with a number of nature preserves and parks as well as some fabulous waterfront homes. This small city is known for its natural setting and beauty, filled with trees and tucked along the banks of the state’s second largest lakes, while the popular Burke-Gilman Trail runs right through on the Lake Washington side, making it ideal for hikers, bikers and joggers. When Lake Forest Park was first developed in the early 1900s, the goal was to maintain the pristine forested topography, and thanks to some longtime residents who resisted urban sprawl, today it remains that way, heavily forest with roads that meander along the hills and ridges, just as it was back in the early 20 th century. With the hilly topography, it translates into much of the Lake Forest Park waterfront homes enjoying views of the Cascade Mountains as well as Lake Washington, not to mention access to a wide range of recreational activities on land and on the water, including kayaking, paddle boarding, boating and more. Residents can also look forward to easily accessing the city’s great urban gathering spot, the LFP Towne Centre, which offers all the necessities, as well as a fabulous farmers market and an amazing, unique new/used bookstore that hosts a food court, community room, and a stage where frequent music events are held. With Lake Forest Park boasting such spectacular shoreline and being nearly entirely residential with heavily-wooded lots dominating the landscape, you’ll find a wide range of waterfront homes that offer lots of privacy. While many homes here built between the 1950s and ‘70s, developers resisted the urge to clear cut, and by purchasing Lake Forest Park waterfront real estate, you’ll get to enjoy the benefits of that especially peaceful setting along with breathtaking views. Take advantage of our industry-leading tools to make your property search as easy as possible and be sure to register for a FREE account so that you can receive email alerts whenever new Lake Forest Park real estate for sale hits the market. If you’re seeking to sell your Lake Forest Park property, contact our Waterfront Specialists directly for a comprehensive listing analysis and to learn more about the cutting-edge marketing strategies we’ll use to sell your home quickly for top dollar!